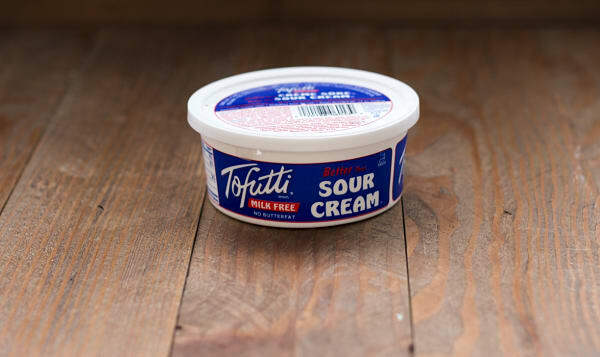 Tofutti's scrumptious plain Sour Supreme is an amazing all-natural solution to your dairy cravings! With no milk, no cholesterol, no lactose, no butterfat, no hydrogenated oil, and that marvelous taste, how could you resist?! This product traveled 3885 km to reach our warehouse. Tofutti's story is the story of a man named David Mintz and his success at proving everyone wrong. When he first began to experiment with tofu, his neighbors said he was crazy. The experts he consulted told him he was wasting his time. His wife thought he had become obsessed. But David Mintz persisted, filling the night with the sound of clattering pots an dhigh-pitched mixers, as he looked for a way to make nondairy frozen dessert from tofu. That was in the late 1970s. A few years later, the result of Mint's incessant experimentation would sweep the nation as Tofutti, a pleasant tasting frozen dessert with no chloresterol, no butterfat, and only about one-third of the calories of premium ice cream. Tofutti is now the flagship product of Tofutti Brands, Inc., a $17 million Rahway, New Jersey company headed by Mintz.